ERT is a technique for producing “slices” through undisturbed archaeological deposits to a considerable depth. Conventional resistivity measures the electrical conductivity of the soil between two probes. This conductivity changes according to the archaeological materials present; for example, a wall might lead to low conductivity. ERT uses an array of probes and compares the resistance between each and every pair in order to produce a cross-section or ‘pseudo’-section through the ground. 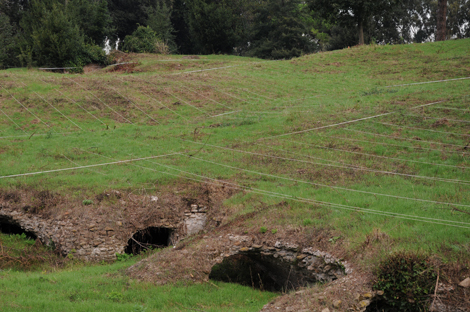 It has proven particularly important at Portus since the early phases of standing buildings are buried to a depth of at least 3.5m and, in combination with GPR, ERT is able to tell us something of the layout of these structures. In one case, it is possible to see the 6-metre-high buried walls of the Palazzo Imperiale in cross-section.